I could have been cute and posted this with the original date, just to throw all of you that read these via RSS. 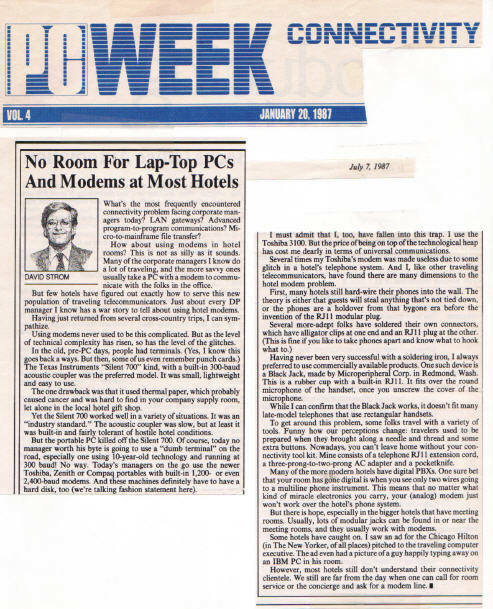 Instead, I will just put the scanned file of one of my earliest columns for PC Week up with today’s date. Back then, we used these things called modems on our laptops — you know, that other hole that is too small for the Ethernet cable to fit into? And if we were really lucky, the hotel phone jack would take the RJ11 cord directly, rather than having to take the whole thing apart. Of course, nowadays we just use Wifi! I remember those days well. And the Electronic Mail Association whose members included some very large companies telling the hotels if they didn’t install Data Ports in their hotel rooms, they would stay elsewhere. Funny thing within two years everyone had them.